Evoparts is a Christchurch owned and operated parts business specialising in Mitsubishi Lancer Evolutions of all models, we have also resently purchased an existing Subaru business and moved to larger premises in Brougham Street. 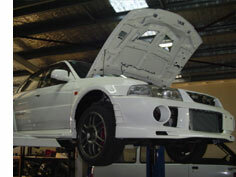 Since 2007 Evoparts has dismantled many Mitsubishi Evos and repaired many more back to excellent road going condition. Evoparts primary function is to provide a constant supply of good quality new and used Mitsubishi parts for Lancer Evolutions, also available is a wide range of genuine Mitsubishi new parts to suit all models. Visit the parts page to view details of our available used parts or contact us to enquire. If we don’t have what you need we will try to source it for you. With a fully equipped workshop we are ideally placed to perform all your mechanical repairs from minor, through to full engine or gearbox work. We can offer free advice on the best options for your repair process. We look forward to your enquires and will endeavour to supply the part you need at a price you like.